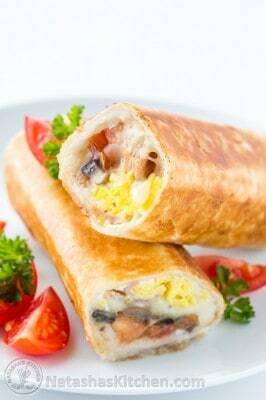 These breakfast burritos are crisp on the outside and filled with tender scrambled eggs, ham, fresh tomatoes and plenty of cheese. We serve them with hot sauce. Heat a large skillet over medium heat and add 1 Tbsp oil. Add mushrooms and sautee until golden (5 min), stirring occasionally. Season lightly with salt and pepper then remove mushrooms. In a medium bowl, whisk together 6 eggs with 2 Tbsp sour cream, and salt and pepper to taste. Stir in the strips of ham. In the same skillet over medium heat, melt 1 Tbsp of butter, add egg mixture and stir/scramble until the eggs are just cooked (3 min) don't overcook. Remove from pan and set aside. Spread a strip of sour cream (about 1 Tbsp) in the center of each tortilla. Top each tortilla with 1/6 of the cooked eggs, a generous sprinkling of mozzarella cheese, 1/6th of sauteed mushrooms and 1-2 Tbsp diced tomatoes. Don't over-stuff or they will be tough to roll. Roll the burrito from top to bottom, folding the edges in tightly when you get to the center. Repeat with remaining burritos. Heat a large skillet over medium heat and add 2 Tbsp oil. Once oil is hot, transfer burritos to the pan, folded-side-down and cook without turning until bottom is golden brown. Cook all sides until golden brown (about 2 min per side), adding remaining oil as needed. Tip: To keep the tortillas pliable and prevent cracking while you roll your burritos (which will reduce splatter on the stove), stack tortillas and place them between two barely damp paper towels. Microwave on high for 30 seconds then keep them between the damp paper towels until you are ready roll them; taking them out one-by-one.